Buy this item and earn 115 ClubPoints. 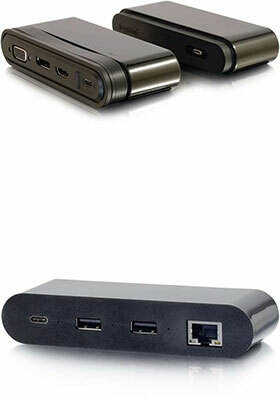 The USB-C Travel Dock with Hub is the perfect solution for connecting a USB-C computer or tablet to an HDMI, DisplayPort, or VGA display when in the office or on the go. Supporting HDMI and DisplayPort resolutions up to 4K at 60Hz - while also providing Gigabit Ethernet - enables the USB-C Travel Dock with Hub to meet your connectivity needs and handle critical tasks so that you can rest easy knowing that you have the connection you need. The included USB-C Hub has 2x USB Type-A ports and a RJ-45 Gigabit Ethernet port. Simply connect the hub to the travel dock to ensure you're prepared for the big presentation.